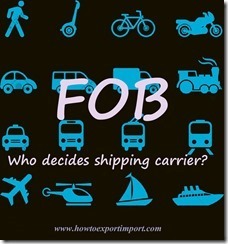 Who decides shipping carrier on a shipment under FOB basis? This article is for beginners of exports and imports. In an FOB consignment, who nominates shipping carrier? Whether exporter or importer? Shipping carrier is a person or company who carries goods to final destination as per certain terms and conditions under maritime law. Shipping carrier is decided on the basis of terms of delivery contracted by exporter and importer. If cost of carriage is paid by the exporter, the carrier is decided by exporter. If importer pays freight of a consignment, the shipping carrier is decided by importer. Do you wish to add more information about this subject - who decides shipping carrier under an FOB shipment? Would you like to share your experience about this subject on shipment under FOB and appointment of shipping carrier under FOB shipment? 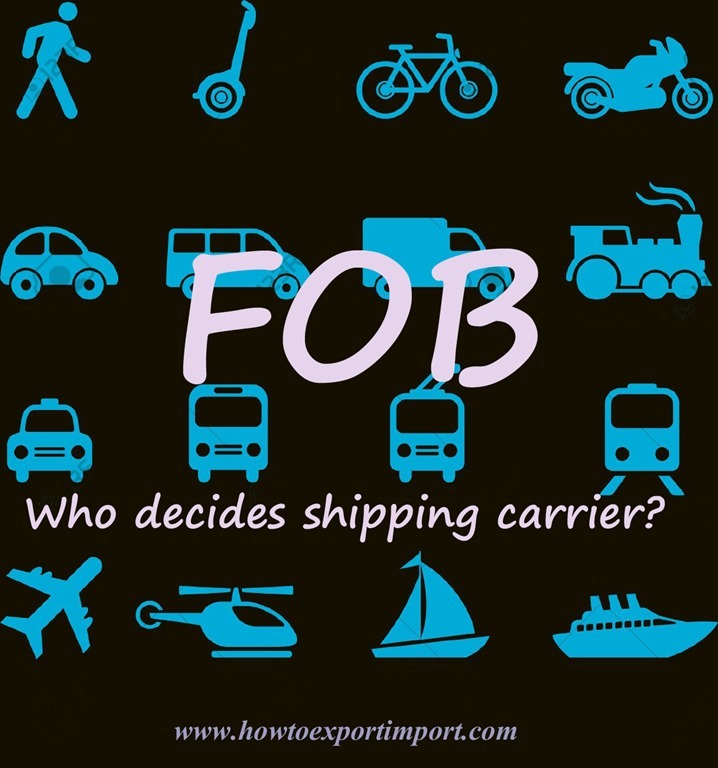 Write below your thoughts about this article - Who decides shipping carrier on FOB SHIPMENTS? Bharat Raj : On 16 February 2015 i am bharat desai from bijapur. i have a regd export firm , i have also got iec .i am interested in exporting agri commodities as a merchant exporter. i have not done any consignments as on today due to lack of practical experience. please let me know whether you can give personal guidance in each and every step involved in export transaction. i would like to start with small investment and non perishable goods.i will be thankfull to you if you can guide me in this regard, i will also pay the required fees/ ppercentage in FOB value as you feel right.i am planning to start export activities in the month of august. Ibrah : On 23 March 2015 Hi I want to buy pajero from Japan the price is 4000?? and also they have put 2000?? FOB what does that mean? Walhekar, Deepak : On 21 July 2015 I just viewed your site on the subject matter. Its really interesting. I am commercial manager working with Dow Chemicals, a US based chemical company does imports to India. We operate on two modules, 1) direct indent by the customer on CIF basis wherein we bring material till sea port and 2) we import material, clear & bring it to local stock points and sells in local currency. In later module, we also do bond-to-bond, HSS etc. I would like to learn more on the imports, material flow, document flow, various options / steps / processes involved from FOB till clearning the material, Taxation etc. Tom: On 03 August 2015 Hi this is a great log. I'm happy to be here thank you. I have2 questions about the fob. I'm about to close a deal with a Chinese supplier the goods cost 20.000$ and the factory is in shenzhen.and it's half of 20 feet freight and the weight is 300 kg. The supplier want 550 $ for fob. Is that the correct price for that? What if next time I'll need full freight. What will be the price? And 2 . If I take fob the supplier arrange the goods and talk to my freight forwarder. And when they load the goods to the ship how I know if the goods are safe? Why should think about FOB Terms of delivery?